Oh how I love this. The creepy non change in tone to their different phrases they “learn”. I love Japanese culture. It leaves us in a few days. January, it always feels like you come in for a party and then exit way too soon. February is a mutual friend of ours, but not as fresh and rad. But it has been a good one. I have been pretty much staying at Caleb’s house all of January, and finally now staying at my house these last few nights. It felt like I had to have a sorry ceremony with my apartment. I got the sense I had betrayed it, neglected it as such and it has just been sitting here. To be fair, my mate Aaron from the US stayed here while the Australian Open was on, but he aint me. My flat didn’t say anything back when I said sorry and lit some incense, but I think it has forgiven me. Though my lease runs out soon.. I won’t announce that loudly just yet. I want to keep steering towards having plenty of printed photos around the place. Digital world has encouraged us to have everything online, but where is the fun when you cannot have these images in your physical space. Whoah, I just felt like I used too many words that a lecturer would use. The word “physical space” being a phrase I relate to a lecturer with a red jumper and a beard, clasping his hands together and looking at the wooden ceiling of the dated lecture theatre. 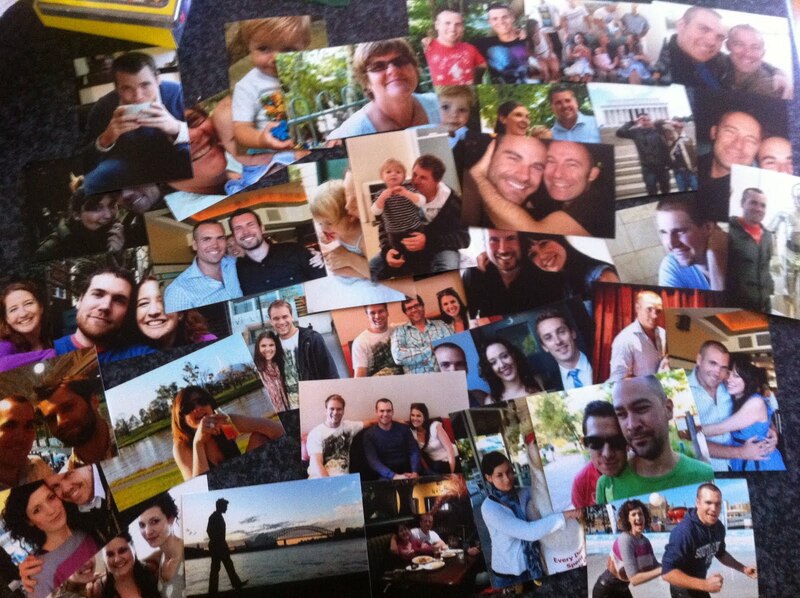 So I have printed a tonne of photos, see above. And cheaply too. Try Big W photos online, 35 photos for 6 bucks including delivery. Go Big Dub! That was not a paid plug, I just was impressed with the photos. And now its like I have some of my good friends and family on a wall, and it looks like a Uni student room. Just the look I was going for. 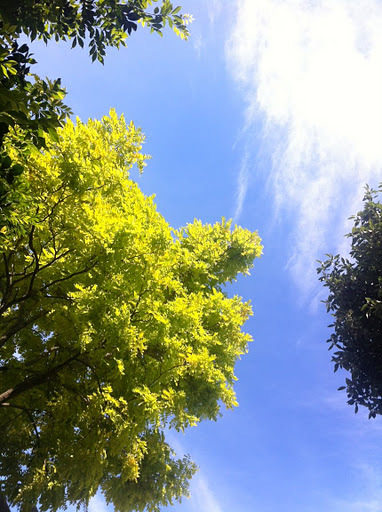 Have I ever mentioned, the colour of this green in the photo is my favourite colour? Well I am mentioning, and a high mention at that. I begin two of my new jobs this week. Shall we guess what they are? Clue: Involves dressing up in 1940’s clothing and being inside a genuine 1920’s built tent, made of fabric and mirrors. 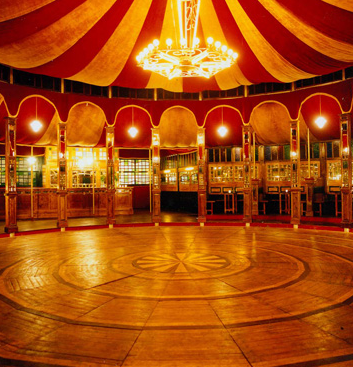 Many famous people have sung in this tent and it now tours the world, visiting Melbourne annually. I will be greeting guests and introducing them to the world that can be anything inside the tent. I simply cannot wait. Answer: Guest Host at The Famous Spigeltent! Groovy! Clue: This space hosted the Queen of England last year, is one of Melbourne’s meeting points and holds many events and festivals throughout the year. I will be helping look after the Operations for the events and installations that occur there, right beside the Yarra River in central Melbourne. 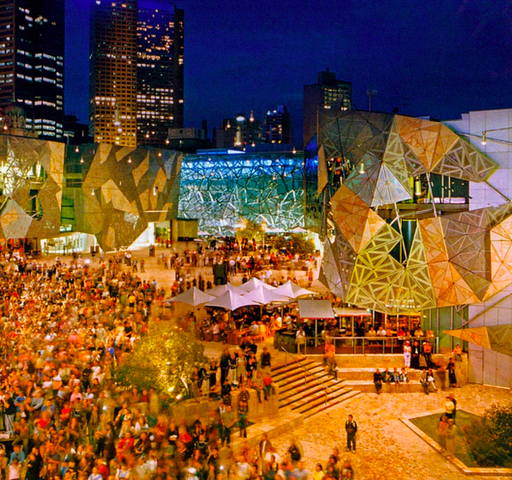 Answer: Operations Coordinator at Federation Square. Rock on! I finish up my job with Australian Open this week and it has been fun. Great people and great work. I will miss the crazy customers asking us to investigate players who secretly smuggle drugs onto the court that leads to an unfair advantage. Sigh. Let us welcome February in two days. See what it brings. OK, let’s! Sitting here with a David Attenborough doco on, it is about cheeky monkeys. They are cracking nuts with big stones and I am finding it hilarious when the nut bounces off the wrong way into the shrubs and the monkeys run after the nut shrieking. Dunno why but that scenario is making me chuckle. Actually I do know why. Cause it is funny. Funny that. Huh. I have started work, helping out a company who produce the merchandise for the Australian Open for a few weeks. It is really interesting to come into an office community and observe the dynamics. The people who are there to build their career, the people who work and live for the weekend and those who have been there too long. And for someone like me who is just there for a brief period, it is really up to me if I want to invest with people. It is great noticing the ways different people have responded to me. The really nice thing is how friendly and relaxed the atmosphere is, with everyone being so welcoming. I reckon if I just got up and danced down the walkway I would have people join me. They so better not read this otherwise there may be some pressure. You know, to dance. And to dance up to the high quality standard I am known for. I may have gone to see the Vengaboys a few nights ago. Remember the late 1990’s band that rocked the world with their Eurotrash Pop? With such intelligent lyrics like “We like to party, we like, we like to party” and “My hearts goes sha la la la la”. Well I was way to curious as to them touring and also the fact the venue was a pub down the road from me. A group of us went and we had no idea what to expect. As we stepped inside, there was a sea of 18 year olds. 18 year olds?? They were probably about 6 when they were popular. But they were there, and screaming loudly. Cal and I were not drinking either as we are so smartly doing Dry January (no alcohol for the month) so Coca Cola was our sponsor. 90’s music was pumping via a DJ while everyone waited, it is what they called the support act. Pretty sure the DJ just pressed play on a CD. Or if he was technical, through an iPod. Lights flashed on and off (the pub seemed to have an amazing lighting system, featuring an “on” and “off” switch. The red curtains open and there stood our Vengaboys. Complete with tacky outfits, they all looked a bit weathered but up for fun. They began singing (slightly lip syncing) their songs, all five of them. In between songs they spoke in their Dutch accent about how excited they were to be Down Under. Whether they were attempting to be dirty was lost in translation. The Encore began when they walked on then off the stage and then suggested to play a White Stripes track. They then stopped and declared they never would, as they represent Sleezy, Cheesey, Trashy Euro Pop, and proceeded to sing their hits again. Hey at least they didn’t pretend to be something they were not. I may have danced slightly also. So thanks Vengaboys for providing high school flash backs where I can finally feel free to sing out “Boom boom boom boom, I want you in my room.”. I have seen so many movies over the past few weeks. 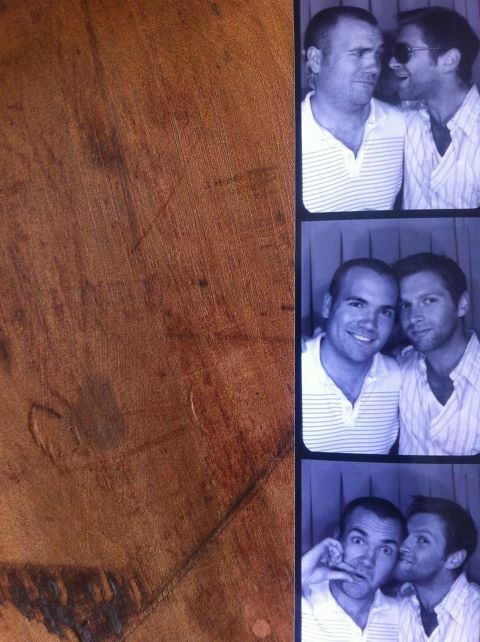 And there is a photo booth out the front of the cinema. It sucked Cal and I into it and we totally reenacted Amelie. I really respect Sia. She is an Aussie music artist who has done so many organic and yet strategic moves, where she balances Pop and reality. She has worked with some of the biggest artists and still reflects how original she is. From the classic “Breathe Me” that was featured as the final song on the final season of the best show on TV “Six Feet Under” to writing a song and singing it for a David Guetta track (even though I cringe at him). This track below just grooves with me. Even if it is Flo Rider. I mainly like the footage, oh London.. Her voice sound like a voice that is nice. Wait, just getting a cookie. Yes so resolutions will totally be kept if you write them down. Or so I hear. My ones, what are my NY Resolutions you ask? Well after a rather in depth discussion with my friend Dale, I want to be able to touch my toes sometime during 2012. I also would like to have written at least the skeleton of a major writing piece. I am going to reduce my swearing, go in more fun runs and look into either studying part time at Uni or doing another creative course. I want to write more actual letters, make peace with a few people and dance more in and out of my bedroom. I want to touch the earth of a country I have never been to, swim at a beach I have never swum at and eat a fruit I have never heard of before. – Write structure of novella. – Fun Runs, more of. I also want to be able to feel like my job is is part of my happiness. Not like this is anything new, as a job should always be a part of your happiness, supporting a contagious joy in the other aspects of life such as relationships, fitness and dogs. The casual cat is alright too. But yes, I got four jobs in January and I have never been able to juggle balls but pretty sure jobs will be OK. February, who knows? If it isn’t a dream job, then my personal time should be focused on building up the things I love to do and sew them into a career, no? It is the best advice about career I have been told. So if you like to collect stamps, do it. And then the investment in the stamps means you are training yourself up to file and collect and appreciate documentation from the past and present, that could lead you into a librarian role. Glasses and a debonair tie included. Well I get my point, and am proud of the point. How good would it be to fit inside a fridge, just for fun! You would then feel really cool and it could be your party trick. Or maybe cause it is a hot day today and Melbourne really has not provided enough water options without chlorine that I am dreaming of being inside the fridge. Though I think the fact I dislike small enclosed spaces will counterbalance the desire to fit inside the fridge. The fridge also may start talking to me about the unfortunate old food that is inside him and how I need to get rid of it. Hmm… well he isnt talking to me so off to the giant walk in Bottle Shop fridge I go!! Damn, it is a public holiday. This kid gets what I mean. Now I have in my google search history “stuck inside fridge”. Thanks brain.